Agua en el D.F. 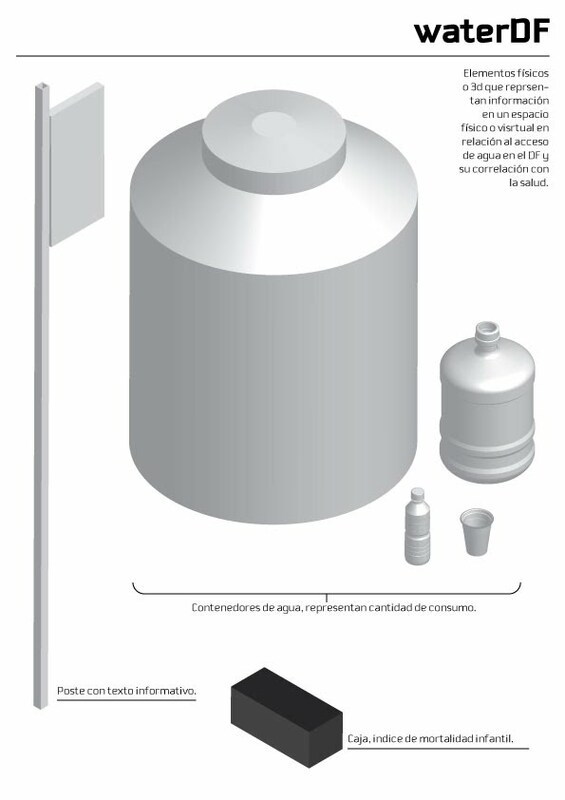 - Water in the Federal District. Mexico. Agua en el D.F. / Water in the Federal District. Mexico. The purpose of this project is to make visible the problem of water in Mexico City, more specifically in DF (Federal District). The way we intend to make visible some of the problems the citizens of the city suffer for lack of water is in a physical, sensorial installation. 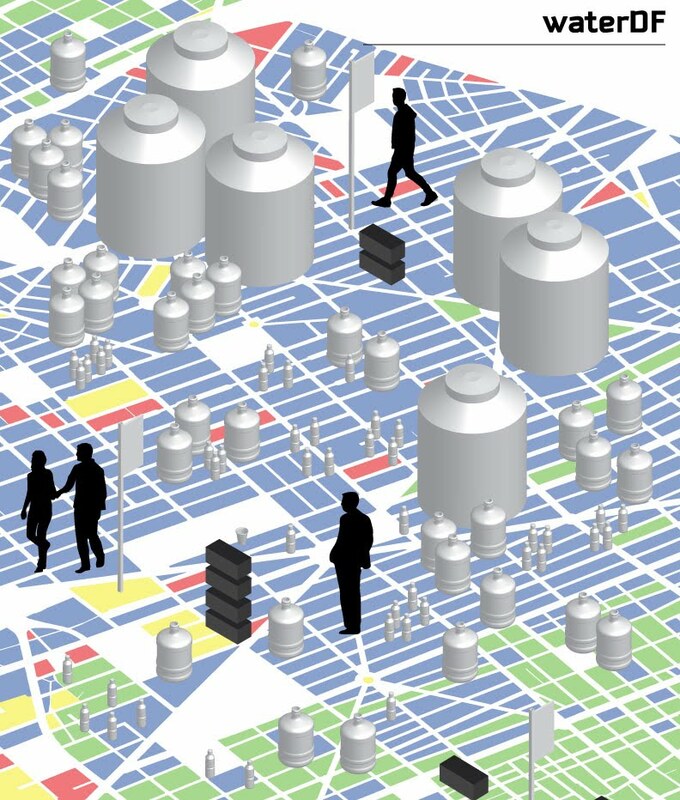 We need a space, a big plane surface where we could paint or paste a first layer of information, color coding the grade of economic development at the level of city blocks. Next is the group of physical elements that will represent information. The bigger container will represent a major consumption, smaller containers will represent lower consumption. Data of usage will give us the parameter for a precise relation. The banner will show information related to the geographical area, like name of the region, locality and more. 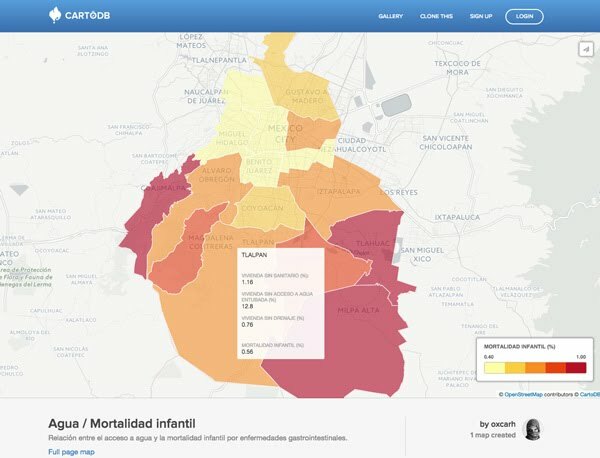 The black box will give us the index of child mortality related to gastrointestinal deseases. There is also our first approach we have done with data from a Federal District "delegation" level. Made in Cartodb. This is a mock up of a section where we see the spatial relation between users and the physical elements of the installation. The space will be greater enough to be able to display on the floor one level of information. In this case is depicted the oficial index of development. Which is useful to know in what blocks of the city people pays very low, low, middle, high, fixed or nothing at all for the public services they receive such as water. ¿How does the web app works? ¡Aguas Güey! 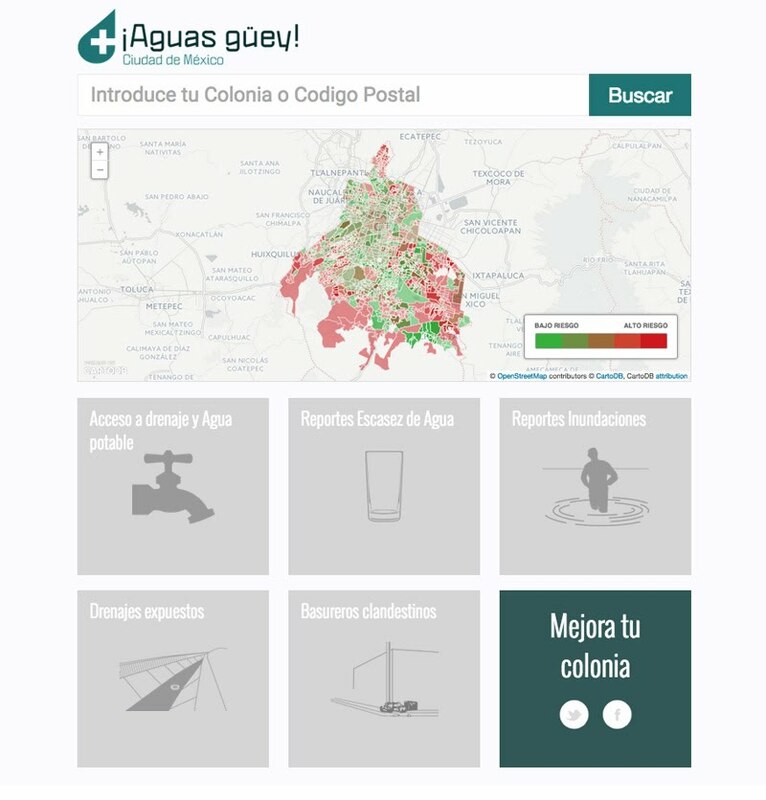 Is the first website in Mexico designed to easily understand the water conditions in your neighborhood and how does inadequate water access and sanitation affect your health. Our web app is focused at the neighborhood level to make it more intimate and personal since it relates to the daily life of the users. We focused in making this web app as simple as possible so that everyone, regardless of their age or computer skills, can find out the conditions in their neighborhood. The web-app considers five different indicators that include access to the water supply and sewage network, floods, water scarcity, reports of open sewages and clandestine garbage dumps. Each indicator is colored and ranked based on a risk scale, where green is low risk and red is high risk. If the user wants to know more about the risk factors associated to the indicator, they can click and a dialogue box will explain them how does inadequate water access and sanitation affect their health and what steps can they take to prevent getting sick. Additionally, to control for potential bias and the differentiated risks to health, we built a relative health risk global indicator that takes into consideration the five indicators. This indicator is represented in the map at the center where if the neighborhood is colored red in the map, it has a very high risk of having health issues associated to poor water access and sanitation compared to the optimal situation in the city. 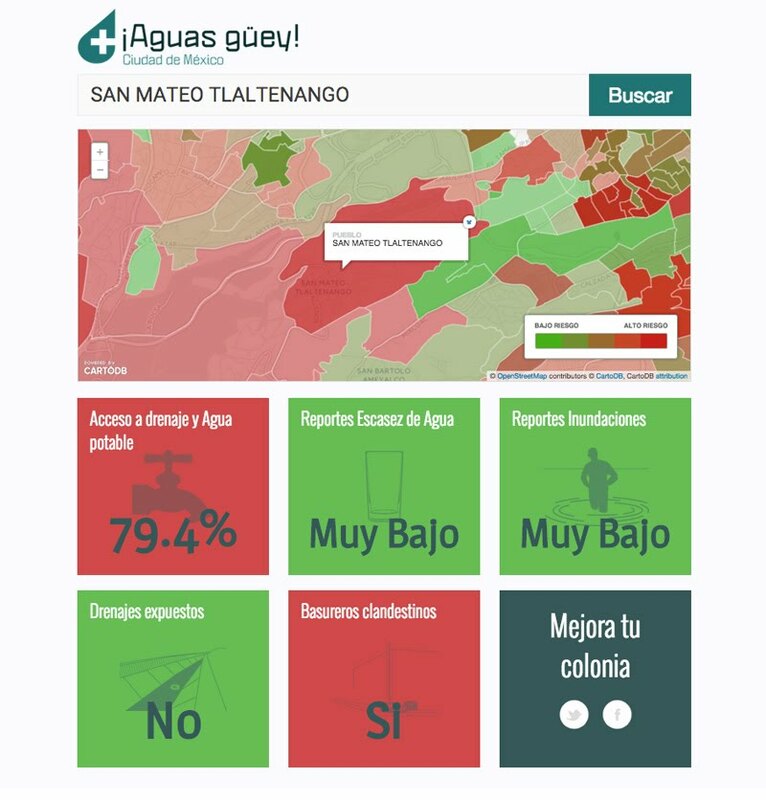 Finally, to motivate our user to take action to improve their neighborhoods conditions, we built a button so that they can tweet a pre built message to their local representatives to pressure to improve the water access and sanitation. ¡Careful friend! And a the same time refers to water.